After working in Go for some time now, I learned how to use an unbuffered channel to build a pool of goroutines. I like this implementation better than what is implemented in this post. That being said, this post still has value in what it describes. On more than one occasion I have been asked why I use the Work Pool pattern. Why not just start as many Go routines as needed at any given time to get the work done? My answer is always the same. Depending on the type of work, the computing resources you have available and the constraints that exist within the platform, blindly throwing Go routines to perform work could make things slower and hurt overall system performance and responsiveness. Every application, system and platform has a breaking point. Resources are not unlimited, whether that is memory, CPU, storage, bandwidth, etc. The ability for our applications to reduce and reuse resources is important. Work pools provide a pattern that can help applications manage resources and provide performance tuning options. 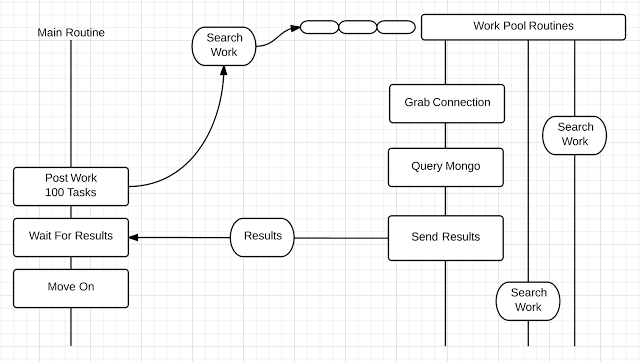 In the diagram above, the Main Routine posts 100 tasks into the Work Pool. The Work Pool queues each individual task and once a Go routine is available, the task is dequeued, assigned and performed. When the task is finished, the Go routine becomes available again to process more tasks. The number of Go routines and the capacity of the queue can be configured, which allows for performance tuning the application. With Go don’t think in terms of threads but in Go routines. The Go runtime manages an internal thread pool and schedules the Go routines to run within that pool. Thread pooling is key to minimizing load on the Go runtime and maximizing performance. When we spawn a Go routine, the Go runtime will manage and schedule that Go routine to run on its internal thread pool. No different than the operating system scheduling a thread to run on an available CPU. We can gain the same benefits out of a Go routine pool as we can with a thread pool. Possibly even more. I have a simple philosophy when it comes to task oriented work, Less is More. I always want to know what is the least number of Go routines, for a particular task, I need that yields the best result. The best result must take into account not only how fast all the tasks are geting done, but also the total impact processing those tasks have on the application, system and platform. You also have to look at the impact short term and long term. We might be able to yield very fast processing times in the beginning, when the overall load on the application or system is light. Then one day the load changes slightly and the configuration doesn’t work anymore. We may not realize that we are crippling a system we are interacting with. We could be pushing a database or a web server too hard and eventually, always at the wrong time, the system shuts down. A burst run of 100 tasks might work great, but sustained over an hour might be deadly. A Work Pool is not some magic pixie dust that will solve the worlds computing problems. It is a tool you can use for your task oriented work inside your applications. It provides options and some control on how your application performs. As things change, you have flexibility to change with it. Let’s prove the simple case that a Work Pool will process our task oriented work faster than just blindly spawning Go routines. The test application I built runs a task that grabs a MongoDB connection, performs a Find on that MongoDB and retrieves the data. This is something the average business application would do. The application will post this task 100 times into a Work Pool and do this 5 times to get an average runtime. Let’s start with a work pool of 100 Go routines. This will simulate the model of spawning as many routines and as we have tasks. The first argument tells the program to use 100 Go routines in the pool and the second parameter turns off the detailed logging. This program seems to run the best when we use 3 Go routines per core. This seems to be a magic number because it always yields pretty good results for the programs I write. If we run the program on a machine with more cores, we can increase the Go routine number and take advantage of the extra resources and processing power. That’s to say if the MongoDB can handle the extra load for this particular task. Either way we can always adjust the size and capacity of the Work Pool. All the code can be found in a single Go source code file called workpool.go. I have removed all the comments and some lines of code to let us focus on the important pieces. Not all the functions are listed in this post as well. The WorkPool structure is a public type that represents the Work Pool. The implementation uses two channels to run the pool. The WorkChannel is at the heart of the Work Pool. It manages the queue of work that needs to be processed. All of the Go routines that will be performing the work will wait for a signal on this channel. The QueueChannel is used to manage the posting of work into the WorkChannel queue. The QueueChannel provides acknowledgments to the calling routine that the work has or has not been queued. It also helps to maintains the QueuedWork and QueueCapacity counters. The PoolWork structure defines the data that is sent into the QueueChannel to process enqueuing requests. It contains an interface reference to the users PoolWorker object and a channel to receive a confirmation that the task has been enqueued. The PoolWorker interface defines a single function called DoWork that has a parameter that represents an internal id for the Go routine that is running the task. This is very helpful for logging and other things that you may want to implement at a per Go Routine level. I create a type called MyTask that defines the state I need for the work to be performed. Then I implement a member function for MyTask called DoWork, which matches the signature of the PoolWorker interface. Since MyTask implements the PoolWorker interface, objects of type MyTask are now considered objects of type PoolWorker. Now we can pass an object of type MyTask into the PostWork call. In main I tell the Go runtime to use all of the available CPUs and cores on my machine. Then I create a Work Pool with 24 Go routines. On my current machine I have 8 cores and as we learned above, three Go routines per core is a good starting place. The last parameter tells the Work Pool to create a queue capacity for 100 tasks. Then I create a MyTask object and post it into the queue. For logging purposes, the first parameter of the PostWork function is a name you can give to the routine making the call. If the err variable is nil after the call, the task has been posted. If not, then most likely you have reached queue capacity and the task could not be posted. The New function accepts the number of routines and the queue capacity as we saw in the above sample client code. The WorkChannel is a buffered channel which is used as the queue for storing the work we need to process. The QueueChannel is an unbuffered channel used to synchronize access to the WorkChannel buffer, guarantee queuing and to maintain the counters. Once the channels are initialized we are able to spawn the Go routines that will perform the work. First we add 1 to the wait group for each Go routine so we can shut it down the pool cleanly it is time. Then we spawn the Go routines so we can process work. The last thing we do is start up the QueueRoutine so we can begin to accept work. The Shutdown function brings down the QueueRoutine first so no more requests can be accepted. Then the ShutdownWorkChannel is closed and the code waits for each Go routine to decrement the WaitGroup counter. Once the last Go routine calls Done on the WaitGroup, the call to Wait will return and the Work Pool is shutdown. The idea behind the PostWork and QueueRoutine functions are to serialize access to the WorkChannel buffer, guarantee queuing and to maintain the counters. Work is always placed at the end of the WorkChannel buffer by the Go runtime when it is sent into the channel. The highlighted code shows all the communication points. When the QueueChannel is signaled, the QueueRoutine receives the work. Queue capacity is checked and if there is room, the user PoolWorker object is queued into the WorkChannel buffer. Finally the calling routine is signaled back that everything is queued. The Go runtime takes care of assigning work to a Go routine in the pool by signaling the WorkChannel for a particular Go routine that is waiting. When the channel is signaled, the Go runtime passes the work that is at the head of the channel buffer. The channel buffer acts as a queue, FIFO. If all the Go routines are busy, then none will be waiting on the WorkChannel, so all remaining work has to wait. As soon as a routine completes it work, it returns to wait again on the WorkChannel. If there is work in the channel buffer, the Go runtime will signal the Go routine to wake up again. The code uses the SafelyDo pattern for processing work. At this point the code is calling into user code and could panic. You don’t want anything to cause the Go routine to terminate. Notice the use of the first defer statement. It catches any panics and stops them in their tracks. The rest of the code safely increments and decrements the counters and calls into the user routine via the Interface. That’s the heart of the code and how it implements the pattern. The WorkPool really shows the elegance and grace of channels. With very little code I was able to implement a pool of Go routines to process work. Adding guaranteed queuing and maintain the counters was a breeze. Download the code from the GoingGo repository on Github and try it for yourself.